Clouds give way to developing rain/snow from south to north, midday to evening. Highs in the 30s. Overnight Wednesday: Snow. Lows in the 30s. Northeast wind gusts over 40 mph near the coast, minor coastal flooding. Thursday: Light morning snow breaks apart. Highs near 40. The northern edge of snow and rain is along the south coast of New England this morning after one storm missed us to the south last night and a second storm is developing off Virginia and intensifying as it passes more than one hundred miles southeast of Nantucket late tonight to the coast of Nova Scotia tomorrow night. Snow and rain arrive at the South Coast by sunrise, and then only slowly advances into the Springfield, Hartford and Boston area by early afternoon. Most of the day should be dry for Vermont, New Hampshire and Maine. There are some sunny breaks that will lower the temperature to get close to 40 degrees. In southern New England, snow becomes heavy during the afternoon and evening, with wind from the northeast gusting past 45 mph at the shore by sunset. With high temperatures in southern New England in the 30s, a wet snow gradually becomes drier in texture after the sun goes down. Highest impact of the storm is overnight, with snowfall rates perhaps close to 2 inches per hour for a little while, and coastal flooding between 3 and 4 a.m. could be minor to moderate south of Boston through Cape Cod and the islands. 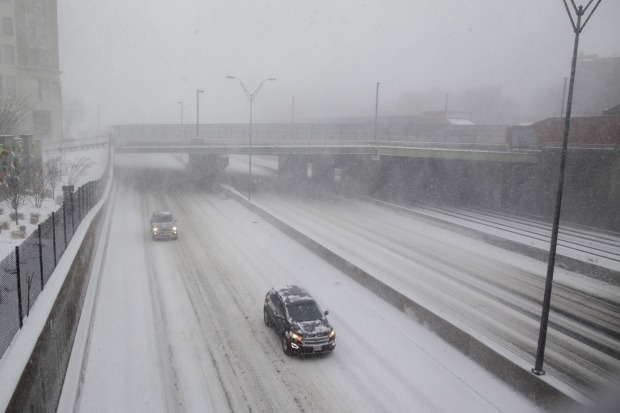 Boston through much of central and southeastern Massachusetts along with parts of coastal Maine could see up to 10 inches of snow. 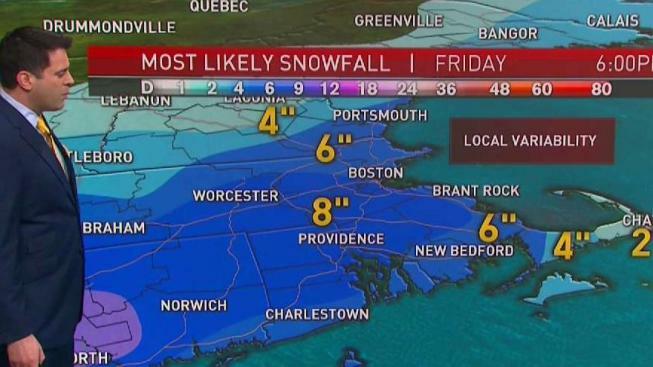 New Hampshire's Seacoast and parts of Massachusetts' North Shore area could see between 6 to 9 inches of snow, while interior parts of New Hamsphire and Vermont will see between 3 to 6 inches of snow. The storm is pretty much done early tomorrow, except for the state of Maine, where heavy snow may continue for a few hours. It will be windy and cold with a lot of clouds and some light snow or rain possible east of the Connecticut River. High temperatures will be near 40 degrees. Friday and the weekend features some subtle disturbances with a chance of snow showers in the mountains and rain or snow showers south, high temperatures in the 30s for the weekend with no big storms. The early call for next week is for a warming trend temperatures back to close to 50 degrees by mid-week, and perhaps storm free for a change.